Last week I popped in to show you my new Asanas Pillow cover that I made from my Asanas Blanket square. 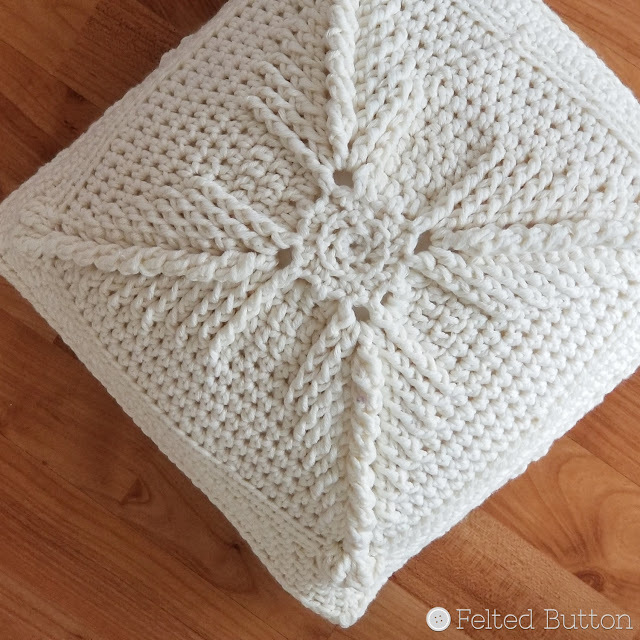 Today is the day to share with you the free crochet pattern. You can read my thoughts about the bulky and heavenly Scheepjes Namaste yarn here. For materials, you'll need 4 balls of Scheepjes Namaste*. And remember, you can choose from any of 34 glorious colors. I used a 6mm (J) hook for extra density. I don't like when my pillow form shows through. I also snagged a square (14"/35.5cm) pillow form from Amazon here*. I also rummaged through my very large button stash and found 5 1 1/8" (2.85cm) buttons for the back closure. They don't match the pillow, or even each other, but hey, life is too short to be restricted in such uniform ways. 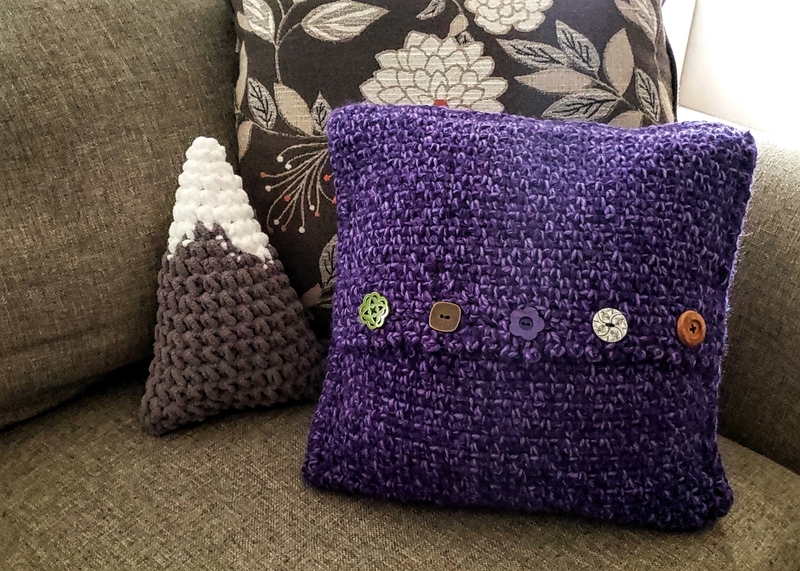 If you want your pillow to be a good fit for your form, you can check your gauge after Rnd 6 where you should be at 4.5" (11.5cm) wide. If you are too big, adjust your hook down a size, if you are too small, go up a hook size. • Pillow front is worked in the round with right side (RS) facing throughout, joining at the end of each round. Pillow back is worked in rows, turning at the end of each. The pattern is written in US terms. Here are the abbreviations you'll find in the pattern. Remember, with the FPCl, you'll do everything in the [brackets] first just one time, then do it all again before you yarn over and draw through all 3 loops on your hook. 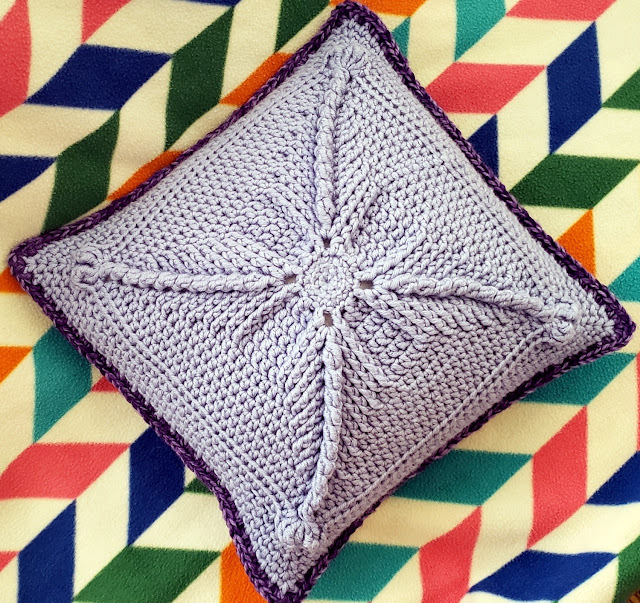 Since the beginnings of this pattern began with my Asanas Blanket. you can get the first 12 rounds of the pattern here, just don't fasten off and let's keep on hooking! Below are Rnds 13-22. Here's a photo of the front made by my tester, Lindsey. Photo by Lindsey King. Used by permission. It's made with a top "buttonhole" placket and a bottom placket so you can remove your pillow to wash the cover. I particularly like the texture and it is worked in my favorite stitch pattern--linen/moss stitch. It is so tidy and versatile and looks pretty on both sides. Because of this, don't give too much attention to the RS and WS as you are working. The only time you need to worry about which side is the right side is the picot edge on the last row of the top placket. Rep Rows 1-2 as for Top Placket until piece measures 8” (20cm). Note: There is no RS/WS with this piece. Just an additional note, if you are interested in making the cover larger, you could continue working the repeat rounds for the cover front to the desired size and then make the back the proper width by increasing the foundation chain in multiples of 2. You'll only need to make one of the plackets a bit taller until the top and bottom plackets overlap. To get things finished up, hold the wrong side of the pillow front and pillow back together with the buttonhole placket of back panel on top. Then sl st through both layers of the front and back evenly around being careful to work through all thicknesses where the top and bottom plackets of the pillow back overlap. Fasten off and weave in ends. 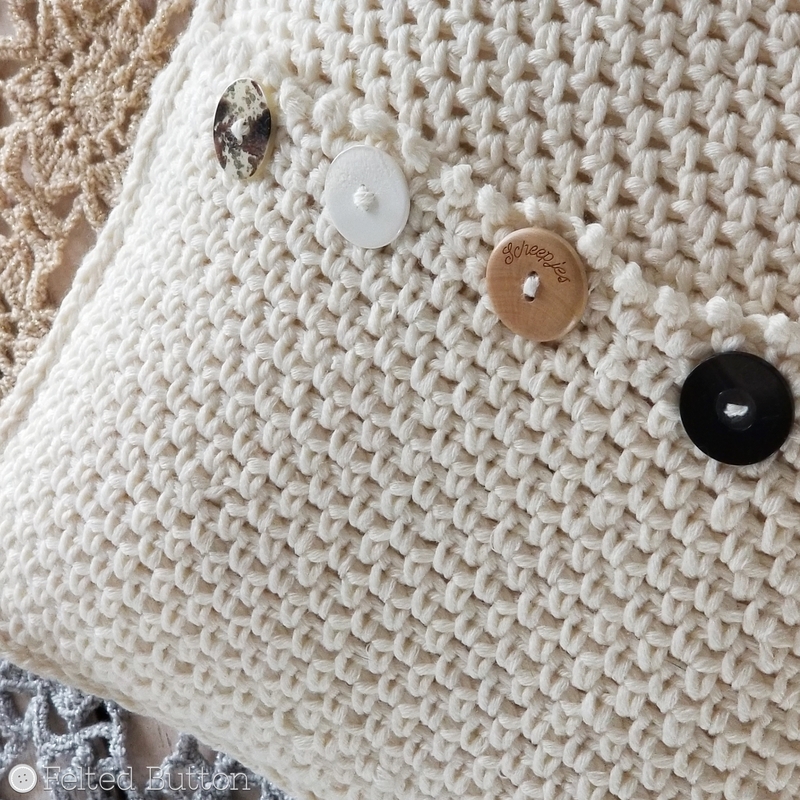 Attach any fun buttons of your choice in alignment with the buttonholes and insert pillow form. So there you go!! I hope you like it. I'm really pleased with mine. If you would like to have a nice and tidy PDF without ads and such, you can purchase the pattern for a small fee in my Ravelry shop here or my Etsy shop here. I just finished painting my bedroom a soothing icy blue and I think my pillow will be perfect in there on one of my sitting chairs in the bay window. 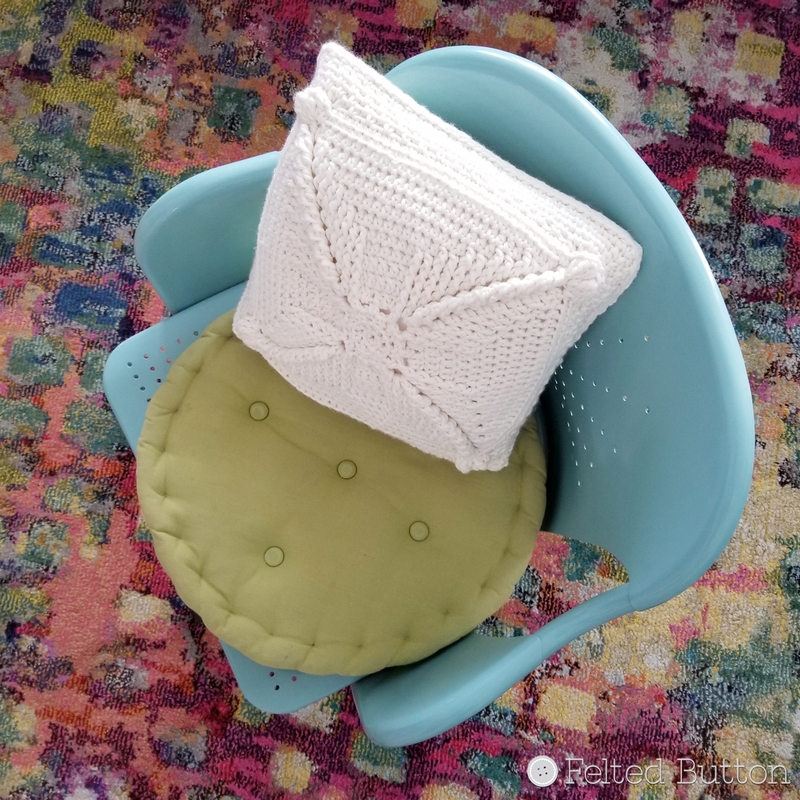 Maybe I need to make a second one for the matching chair...hmmmm. *This post contains affiliate links. 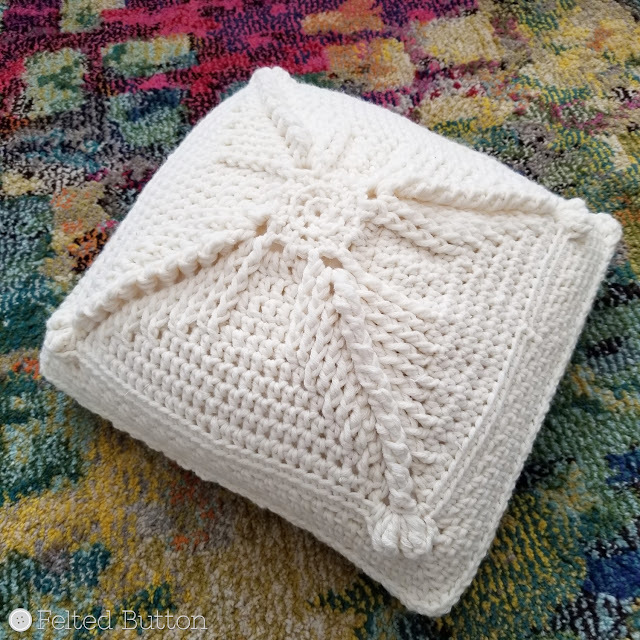 If used by you they cost you no more, but provide me a small comission that allows me to continue providing free patterns. Thanks!